Well, amazingly in the last few days, the universe with all its stars and moons must have somehow aligned and pointed in my direction. A truly amazing thing has happened...I have won two sewing competitions! 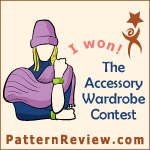 I won the 'Accessory Competition' on Sewing Pattern Review with my Divine Dinner Dress by Savage Coco Patterns. There is a lovely write up about the contest here, which also shows the beautiful creations by the second and third prize winners. I can't wait to receive and try out my prize of a very special, fitted ironing board cover with felt pad and pressing cloth. My ironing board is in dire need of a makeover and this will be most appreciated. Even better is that these covers are made to the highest standard by disabled workers in Australia. Thank you to Pattern Review for the competition, Interface Australia for the lovely prize and to the fab Coco for the pattern. I also won the 'Copycat Challenge' on Erin's blog 'I heart fabric'. Erin writes a lovely blog about her sewing adventures and was recently featured on the Burdastyle website. I don't know how she manages to make so many amazing creations. She has a good eye for fabrics and variations on a pattern and is able to produce many beautiful and unique dresses from one pattern. Her challenge involved copying a ready to wear (RTW) item as closely as possible, which is always good fun. 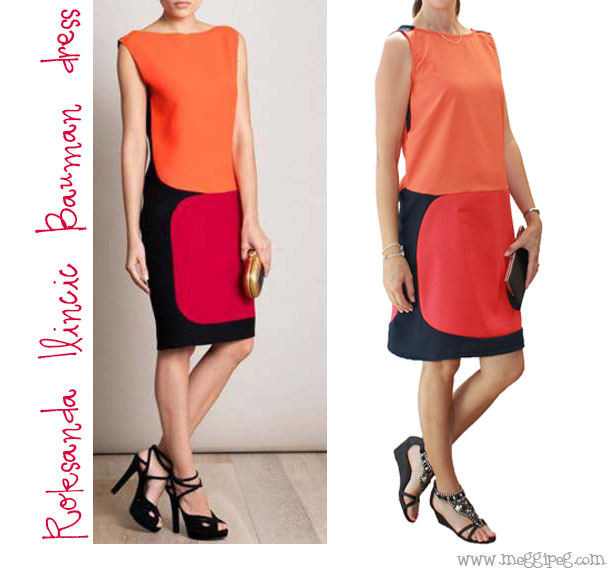 I made this copy of a Roksanda Ilincic dress. I used the pattern for the 'Elegant Escape Dress' by Savage Coco, which I painstakingly cut up into the shapes required to make this dress. You may have noticed that both wins involved Savage Coco dresses. I can't rate these highly enough for style and general fabulousness. It just shows that if you want to win a competition, you can't go wrong with Coco! The entries in this competition were just fantastic. I particularly liked the Gwen Stefani pants by That's Sew Amy and Erin's beautiful Royal Lace Dress. The prize of 'The Burdastyle Handbook' and a voucher for Megan Nielsen Patterns is beyond awesome and I can't wait to receive them. Thank you Erin for this super-fun challenge. And if that wasn't enough, I received two nominations for the Leibster Award from Maud Made and That's Sew Amy. Unbelievable! Thank you both for liking my blog and choosing me for the award. I'm just ecstatic that a few people are reading what I put out there! 1. What got you to start sewing your clothes? My mum sewed and I just naturally began sewing from a very young age. I remember sewing clothes for my doll that no amount of pulling could get over her arms and head...until Mum taught me the important lesson of seam allowances! 2. What do you most want to make in the next 6 months? I have had fabric for ages to make a copycat pair of Sass and Bide jeans with white panel detailing. I want these! 3. Fabric or pattern first? Nine times out of ten it's fabric first. I can't resist buying something when I go to the fabric shop and, even better, are the unique (and cheap) finds at the op shop. Then I peruse my favourite pattern books (like Drape Drape 1, 2 and 3) for inspiration. 4. Which part of sewing your own clothes do you like best? I love to get started on the actual sewing and see an item come together. I always try it on at every possible stage and sometimes sit sewing in my underwear ready to try it on yet again! 5. Which part do you like least? 6. Your favourite sewing blogger? It is very hard to choose, but probably Carolyn of 'Handmade by Carolyn'. She actually lives down the road from me and sometimes I spy her looking fabulous and walking with her gorgeous dog. It's like spotting a celebrity (we've never properly met)! I also have to mention Daniel of 'Manhattan Nest' for a great read every single time. He can make a new light fitting hugely entertaining. 7. What other big obsessions have you had in your life? (real life love affairs not included). Apart from family, that would be my first car, a classic Holden Torana, my windsurfer and hip hop dancing. 8. What's your day job? I'm a research scientist who stays at home and makes custom cushion covers for money! 9. What's the most daring thing you have ever done? I moved to Montreal, Canada from Australia when I was 27 for my first proper job, a postdoctoral research position studying the inner workings of parasites. I knew no one in the entire of North America. It was lonely at first but ended up being completely awesome. 10. What are your secrets for a happy life? Keep things simple. Time is far more important than money so work less. Stay positive. Laugh with people you love. Create. Thank you to the effortlessly cool Amy and the warm, funny and stylish Lucy for this award. I am touched. I'll leave you with a picture of me (middle), my sister and my cousin on Southwold Beach, UK a very, very long time ago. Congratulations on your wins...but best of all, you have 2 gorgeous dresses to wear! Thank you, I am very excited! Congratulations! You deserve every kudo and prize. Obviously, the Universe is hip to your fabulousness. But we mere mortals already knew this. Woohooo! Congrats!!! How exciting :) Great prize, too! I know! How lucky am I? You have been doing great work for a long time so it's great to see all the stars in the universe line up and recognise your talent. Both dresses are fabulous. Wow! congratulations on both your wins!! and well deserved, I reckon. Your two dresses are both just gorgeous. Thank you also for mentioning me, that's very sweet of you. Yes, it's beyond silly that we haven't "met"properly. We really should get together for a cuppa sometime. I'm sure we'd have lots to talk about! Congratulations! That is fabulous. I voted (I think, if I remembered to go there:) for that dress on PR, I just love it. Good for you! Your RTW knockoff is great too. Thank you so much for voting. It means a lot. Yay! Woo hoo, well done, that is all most exciting. And thanks for answering my questions, I love finding out a bit more about people. Maybe we need a small video of you doing some hip hop dancing in a me made outfit!? Couldn't agree more about your happy life secrets too. Congratulations! I love all your Savage Coco creations. Apart from being a talented sewist, you have your own unique style - elegant and charming. Congratulations on winning the two competitions. Very well deserved. I remember both dresses very well. Your projects are always professional, very well fitted and the photographs are great.